During my afternoon visit to Adare, Co Limerick, earlier this week, I took time after lunch on Thursday afternoon [24 May 2018] to visit Adare Methodist Church. 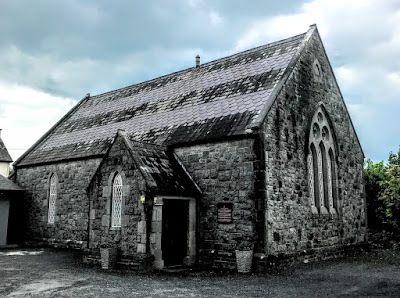 Like the former courthouse in Adare, which reopened as a museum on Thursday evening, the Methodist Church in Adare was built thanks to the patronage of the Dunravens of Adare Manor, and was also designed by the Limerick-born architect William Fogerty (1833-1878). The church was built in 1873, but the Methodist presence in Adare dates back more than a century before that. Adare has a long tradition of Methodist worship, and two and half centuries ago John Wesley, the founder of Methodism, visited Adare and the surrounding area at least ten times between 1765 and 1778. A strong local tradition says John Wesley preached under an ash tree near the ruins of the Franciscan Abbey on least one of those occasions. A stone now marks the place, and since 1819 Methodists have held a field meeting there each year, on the first Tuesday in June. The first Methodist chapel in Adare was built in 1794 on the north side of the road to Patrickswell, in the townland of Gortnaganniff. The road has since been realigned and the site, in the present Adare manor Golf Course, is now unmarked. No images of this early chapel survive today. But it was probably similar to many other Methodist chapels of the time, with their more simple style. By the 1870s, the centre of the village in Adare had moved westwards as the Earls of Dunraven built the cottages that have since made this one of the prettiest villages in Ireland. The site for a new Methodist church was bought at this end of Adare, on Black Abbey Road, a little outside the town. The Countess of Dunraven laid the foundation stone of the new church on 25 January 1872. She was Florence Kerr, a daughter of Lord Charles Kerr and a granddaughter of William Kerr, 6th Marquess of Lothian. Her husband, Windham Thomas Wyndham-Quin, 4th Earl of Dunraven (1841-1926), succeeded to the family titles and to Adare Manor in 1871, and was a member of both the House of Lords and the Irish Senate. Adare Methodist Church is similar to many Methodist churches built at that time in this area. It is a gable-fronted church, with a three-bay nave, a lower gabled chancel at the west end, and a gable-fronted, single-bay, single-storey porch at the south side. The church has a pitched slate roof with cut limestone copings and carved limestone brackets at the gables. There are snecked limestone walls with a cut limestone plinth course and dressed limestone quoins. There is a dressed limestone pointed arch plaque at the east gable. Fogerty’s preference for the Gothic style in church architecture is also seen in the pointed arch openings with dressed limestone chamfered block-and-start surrounds and the quarry glazed windows. The triple lancet openings at the east gable have a shared dressed limestone chamfered block-and-start surround and have three quatrefoil openings above within circular chamfered surrounds. This window has a carved limestone hood moulding over. The original porch new serves as the vestry, and the small porch is a later addition. There is a square-headed opening at this porch with a dressed limestone chamfered surround, plinth blocks and timber battened double-leaf doors. The hall was added in 1950. The church and hall are surrounded by a cut limestone boundary wall with cut limestone copings, cut limestone square-profile piers with caps and a cast-iron gate. For more than 80 years, the Methodists rented a house for their minister in Adare. In 1955, a site was bought was bought and a manse was built on the Rathkeale Road. Part of the site was later developed as sheltered housing for the elderly. This opened as Embury Close in 1988. The Revd Ruth Watt is the present Methodist minister in Adare. Many of the members are descendants of the Irish Palatines, who moved here in the 1760s or later from the parent settlement in Ballingrane. The restraint in ornamentation and the church’s modest gabled form are characteristic features of Methodist churches. 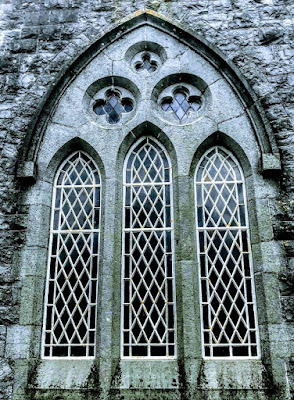 The fine stonework adds artistic interest, along with the east window and its surround, and the church complements the variety of church buildings in Adare.